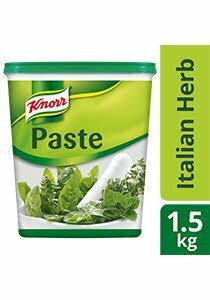 Knorr Italian Herb Paste is a ready-to-use blend of Italian herbs. Full of taste and flavour, Knorr Italian Herb Paste is perfect as a marinade. Gives a unique Italian touch to your dishes. Sugar, Salt, Palm Olein, Palm Fat, Permitted Flavour Enhancer (E621), Yeast Extract, Oregano, Garlic, Chilli, Black Pepper, Basil Leave, Thyme, Spice. Contains Permitted Citric Acid, Flavouring (Contains Celery). All food additive used are from Plant and synthetic origin. May contain traces of cereals containing gluten, egg, fish, crustacean, mollusc, soy, milk, peanut and tree nuts. For Marination: Add 50g of Knorr Italian Herb Paste to 1kg meat.